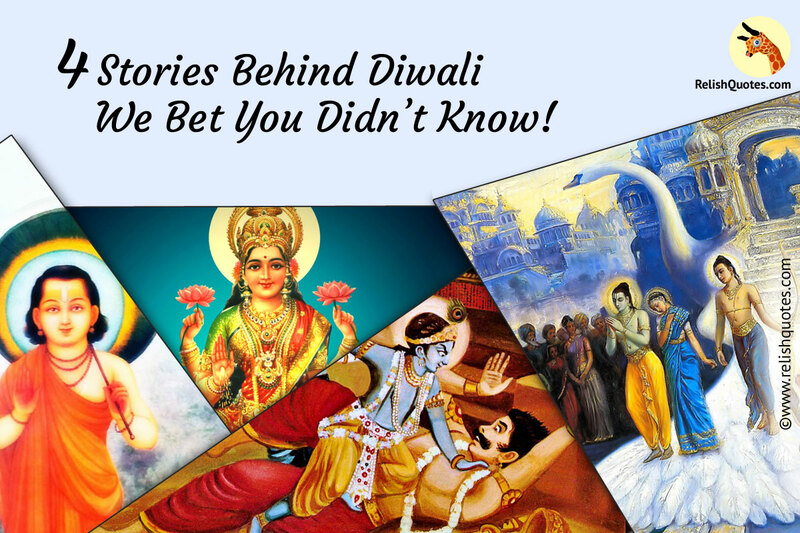 Diwali Celebrations – Let’s Have a look at the stories, which are attached to add historic glory to this propitious day of Diwali. Diwali is here and along with it is fun, cheer, shiny and glittery crackers, boxes filled with gold and silver sweets to relish, shopping sprees, colourful lanterns adorning the markets and fashionable clothes out for sale. But is the festival of Diwali all about just fun, food, shopping and happy family moments? The most quintessential thing to do on Lakshmi Puja is worshipping the Gods and Welcoming the Lady Luck-Goddess Lakshmi who with her auspicious feet ushers in happiness, wealth and homes and the hurdle remover Lord Ganesha for good luck. Let’s bring the Gods and Goddesses together and have a look at all the various stories, which are attached to add historic glory to this propitious day! Backed by Hindu Mythology, Goddess Lakshmi symbolises and is worshipped for personal virtues, success wealth, beauty and prosperity. “Lakshme” in Sanskrit meaning “goal”. The celestial milky ways and oceans were churned by the Gods and Demons to attain the immortality nectar or Amrit. This churning of Oceans is called, “Samudra Manthan” and on this day Goddess Laxmi emerged from the oceans, of milk called the Ksheer Sagar, on the new moon day of the Hindu month of Karthik. It is believed that she brought wealth and prosperity. Lakshmi chose Lord Vishnu as her Consort and married her this day, and each time Lord Vishnu’s avatar appeared on Earth, he was accompanied by Goddess Lakshmi. Lakshmi appeared as Sita with Lord Ram, she was Rukmini with Lord Krishna. Some believe that on the day of Diwali Goddess Lakshmi enters the house and thus sweets and vegetarian food are the calls of the day. The 3rd day of 5 days of Diwali is completely dedicated to her. Goddess Laxmi is worshipped for material abundance, spiritual prosperity, removal of troubles from the path of life and business. Special rites and rituals are performed to make her happy so as to receive her showers of blessings and splendour. “You are the ruler of the skies, the earth and the underworld. Would you give me the space that I could cover with three strides?” King Bali laughed and thought that dwarf won’t need much space so he agreed to the Dwarf’s request. On this, the dwarf changed into Lord Vishnu and his three strides covered, the earth, the skies and the whole Universe, and King Bali was sent to the Underworld. So as a part of Diwali celebrations, Hindus remember King Bali. According to Bhagwad Puran, there was an evil demon king called Nakarakasur, who was a terrible and cruel ruler. He was the demon of filth and dirt and used to capture beautiful women and force them to live with him. Lord Krishna defeated Narakasur and freed 16,000 women. To symbolise his victory, Lord Krishna smeared the dead demons blood on his forehead. He returned on the Morning of Narakchaturdashi. The womenfolk massaged scented oils on his body and gave him a bath. Since then the custom of taking an oil bath before sunrise is practiced in the south zone and Maharashtra region. According to the epic “Ramayana” it was the new moon night of Karthik month when Lord Ram, Maa Sita and Lakshman returned from a 14-year long exile and Lord Ram was also returning after defeating the dangerous demon- Ravan. Good had triumphed over evil and to honour him the entire Ayodhya was lit up with clay lamps, to prepare for a grandeur filled welcome for their King. Age old mythological facts and folklores hold a thousand stories, tales and secrets that are waiting to be unfolded and discovered by us. Didn’t we all enjoy the story telling sessions, in the lap of our grannies? It’s time to revive those tales and go back in time, turn those history and mythological texts and know the significance and various reasons of celebrating Lakshmi Puja so as to make celebrations meaningful and happy.